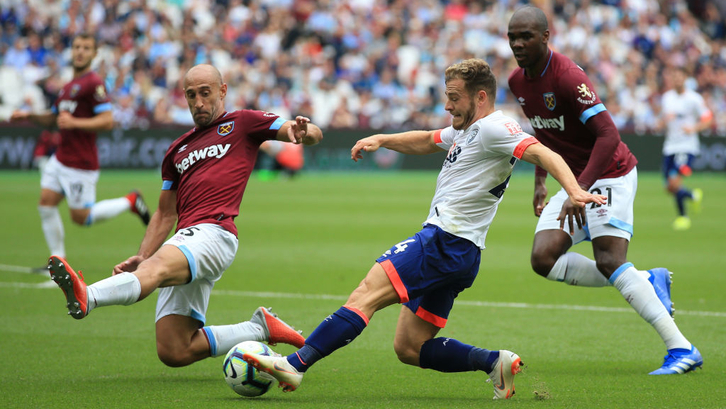 Zaba had a great game against Bournemouth and was at the heart of most good things the Irons managed to produce but afterwards he made it clear he’s not a happy bunny. Speaking to West Ham TV he said: “We’ve not had the greatest start to the season. Today was our first home game, in front of our fans, and we were positive for the game. We were thinking today was a good chance to get three points, but we had the same old problems. “I think, psychologically, we need to change a little bit as a team. I thought we had a good 45 minutes. We were good, we were intense. But in the second half we didn’t have the same intensity, and we gave them the chance to score goals. That is what we have to improve on this season. He added: “I thought we played really well at times. We kept possession and we created a few good chances and we didn’t give them many chances to play. It was only one chance for them in the first half. “In the second half, we dropped our intensity and this is the worst thing you can do as a team in the Premier League. We gave the ball away very easy and we should have done a lot better. We didn’t create much and without the ball we weren’t defensively strong enough. Zabaleta knows the size of the challenge facing him and his teammates on Saturday. and said: “It’s another tough game away at the Emirates but there’s still a long way to go. We cannot put ourselves in a situation where we don’t believe in what we are doing. We are working well in training but we’ve got so much room for improvement. Am I the only one getting totally fed up with players being dragged out like naught boys in front of the rest of the school to tell us what we already know -defensive mistakes, lack of intensity etc etc. We know the problems as we go into our third consecutive poor start to the season (& even 2015-16 didn’t start too well) but what we would like is some evidence that they are being put right. Exactly right 64 they go over the same excuses week in week out it’s about time they played a full 90 min without these problems..DO SOMETHING ABOUT IT THEN. Well said Zaba, there was improvement but a lot more required COYI !!! For same old problem read same old personnel. Changing the manager, changing the system, or changing the tea lady, stand for nothing if the same old culprits are guarding the shop. Going to all that bother of trying to re-invent the club, means nothing when Masuaku and Ogbonna are still in the most important positions on the field. All this waffle about attacking football and new players means nothing when such hopeless players are playing in our defense. It’s typicall that the team were playing well and scoring first, but a couple of defensive errors throws the whole game away. The okey-dokey cup ( whatever ) could not come quick enough, so we can start with Diop and Cresswell, and hope Diop is then ready to step up to the plate. Defense is the most important part of any team. With 4 reliable defenders we at least have a chance to hone the attack into a real force. ‘Defenders’ – the clue is in the name. Or am I mistaken? We all love to see us attempting open exciting play. but there’s also great satisfaction in seeing one of our own tackling their hearts out and not letting the opposing forwards get a sniff. And real defensively-minded plalers get that same satisfaction in stopping the opposition. Are some of ours current crop true defenders at heart, or just frustrated forwards who just were never quite good enough further up? Is the modern game that much different, that defending itself is just an optional extra? Our defensive heroes of the past must be gnashing their teeth … or their dentures. It looks to me that Declan Rice takes real pride in his defending – reckon he’s better at his young age than what we had out yesterday. Shame Zaba isn’t 10 years younger, too. Good job the struggling Gunners will be a pushover next week. COYI … I think. Yep I was at the game yesterday. Yes we were good at sorts in the first half but if it was not for Fab pulling off two great saves we could have been 2.1 down at half time. It’s quite evident we are playing a high line game our midfield is getting caught out on the counter and are not tracking back fast enough. It was the same as what it was at Liverpool. Arny was left on his own to much but he did have two chances to square the ball for easy tap inns but choose to do it all himself. I can see we are going to have a tough season yet again I cannot see us wining a Prem game until maybe the Wolves game. But by then the confidence levels will be rock bottom as it showed in the second half yesterday. You only have to look at their 2 goals and can pretty much bypass the rest of the match to see where all our problems lie.Slow static midfield and a pair of plodding centre halves.Spent £22 mill on Diop and he doesnt even get a look in.Big problems for Pelle and he needs to prove his worth as he hasnt got the gems he had at City to work with. My personal opinion of West ham ? Is the team are like a box of expensive chocolates or even like a cream egg??? All nice on the outside but have very soft inside or centre????? “And thats all i want to say about that” quoting Forrest Gump!!!!!! !